Suzanne Massie is ‘the greatest student of the Russian people’. The United States and Russia have hit a new nadir in relations, and jokes about Cold War II are familiar fare on Late Night television. Suzanne Massie’s long-anticipated personal memoir, “Trust But Verify: Reagan, Russia and me” provides some common-sense advice for those who care about frayed bilateral ties. Reagan was determined to work outside of his inner circle, Massie explained, and learn something none of the Kremlinologists seemed to know: Who are the Russian people? What are they like, and what do they want? Between 1984 and 1988, the Reagans delighted in lunching with Massie, according to Reagan’s diaries. A dynamic extrovert who is blunt and salty in her language, she is also down-to earth in her manner. Massie also probably won the hearts of Russians with her combination of razor-sharp intellect mixed with healthy self-deprecation. Massie never lacked in drive and ambition, but also has a fun-loving streak. In the book, she describes her inability to eat in front of the president, and her efforts to shell a shrimp with her bare hands in front of him, the shrimp sliding across the table. The title of the book comes from the most important thing Massie said she shared with President Reagan, a Russian proverb, “Trust but Verify.” The phrase, a Russian adage that because of Massie is now part of the American vernacular, was a huge hit with Reagan. She encouraged him to learn it in Russian and use it with Gorbachev when they met for a Summit in 1986. Born in New York to Swiss diplomats, Suzanne Massie graduated from Vassar College, and studied at the Sorbonne and the Ecole des Sciences Politiques in Paris. Massie has been involved in many aspects of study and work in the Soviet Union and Russia for nearly 40 years. A fellow of the Harvard Russian Research Center (now the Davis Center) from 1985-97, she has also served on the Board of the International League for Human Rights. She has written extensively about Russia. 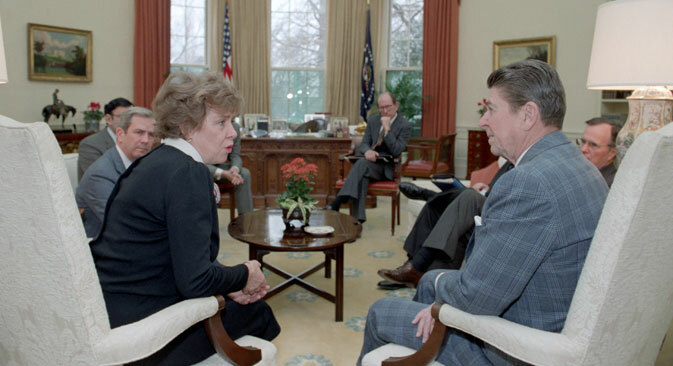 She has briefed the U.S. Congress and she advised President Ronald Reagan during the critical years at the end of the Cold War. Reagan said it in Russian - “Doveryai, No Proveryai” - in his speech during a tense moment, and offered a real ice-breaker. Gorbachev laughed and said in Russian, “You say that at every meeting.” The room filled with laughter. Gorbachev said later that upon hearing that phrase, he knew he could work with Reagan. Suzanne Massie is the daughter of Swiss diplomats and grew up speaking French as well as English. She was born in New York and is American by birth. When the duties of parenting a chronically ill child with hemophilia became daunting, Massie found herself enrolling in a Russian class. “After he suffered a particularly severe medical crisis, to save my sanity, I enrolled in an adult education course in Russian language at a local high school,” she wrote in the prologue. Suzanne and Robert Massie, her first husband, researched everything they could about hemophilia, its history and the quest for a cure. They became fascinated by the story of Tsar Nicholas, Empress Alexandra, and their son Alexei. Their own son, Bob Massie, spent his childhood in braces and lost both his knees to hemophilia. He would eventually contract Hepatitis and HIV from blood transfusions. Yet Bob Massie is among the first patients to show a natural resistance to AIDS and is participating in medical studies at Massachusetts General Hospital. An activist and Episcopalian priest, he published his memoir ,“A Song in the Night,” with Doubleday in 2012. “Why Are We Always Wrong About Russia?” is a speech Massie wrote in 2001, though it has been updated many times. Recently, she added her thoughts on the complexity of Russia’s relationship to Ukraine and Crimea. “I keep updating the speech, but the essence of it is the same,” the historian said on the phone from her home in Maine. She wants to offer observers of current events more historical context, she said.